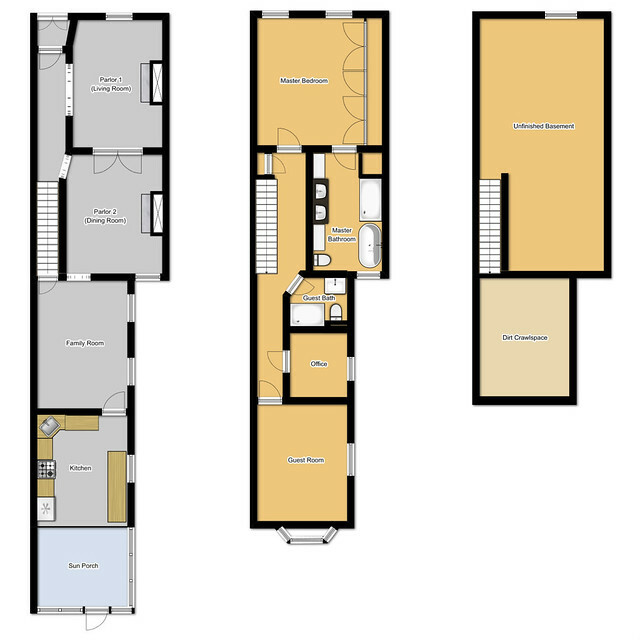 Since starting our blog back in 2011, the thing we've been asked for most frequently (and have never delivered on) are floor plans that show the overall layout of our home. 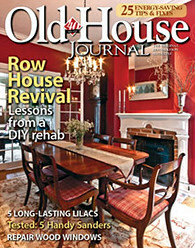 It's not a surprising request, especially given the narrow "shotgun" layout of our 15 foot wide home. Many people can't really get a true sense of how the rooms are set one after another until they get an in-person tour. Photos of the rooms simply don't offer a clear depiction of how everything flows. Now, after putting off the creation of detailed floor plans for quite some time, I finally got myself in gear enough to scrape together a rudimentary floor plan representation using free online software. It's by no means meant to be a true architectural rendering of our home, nor is it even 100% accurate down to the specific measurements, but it should be good enough to give you a pretty solid idea of how our home is laid out. Starting with the first floor, our home's entry vestibule leads directly into our entry hallway. This is the same vestibule we were working on back when we started the blog, and the same hallway where we undertook the harlequin paint treatment with successful results. Just off the hall, the first floor houses our home's double parlors, which we use as a formal living room and dining room. Each parlor has a fireplace, but only the front fireplace is currently in working order. Beyond the parlors sits the family room, which is then followed by the kitchen and sun porch. At five rooms deep, our home is a rare one in Old Town where the main floor has a kitchen, dining, living, and family room. Many homes have one or two of those rooms split off and placed in either the basement or second floor. We consider ourselves fortunate to have this type of a first floor layout. The second floor is pretty standard for a two bedroom space. The master bedroom is at the front of the house and the guest bedroom is at the rear. In between the two you'll find the master bathroom, guest bathroom, and our office (which you could argue as a very small bedroom/nursery). You might also notice the shocking lack of closet space. The only original closet to the home is just above the stairs, outside of the master bedroom's door. Our master bathroom was also once a bedroom, but was converted into a bathroom long ago. While that does take us down to only two bedrooms, we're glad to have such a generous space for a bathroom. And that leads us to our basement. Oh the horror of our hoarding zone that has the potential to be a gem of a finished space, if only we have the time, patience, and desire. The basement is the final and largely untapped space in the home. It's unfinished, except for the stairwell area that we turned into a coat closet, and currently acts as a storage area, utility room, laundry room, and wood shop. The front portion covers the first and second parlor while the back portion is simply a partially dug out dirt crawlspace. Perhaps some day we'll both dig out the remainder of the space and finish the main area. Oh to dream the impossible dream. As you can see from the floor plan, our home is somewhat unique in its layout. Growing up in suburban new construction, it took us a little getting used to when we moved in, but row house living has its advantages and we've really taken to it. What do you think of our layout? Does it seem functional enough to you that you could live in it, or is it simply too much of a departure from what you're used to? Year In Review - We Didn't Finish a Damn Thing! For a while (maybe a few years ago now), I had trouble figuring out the layout, but after several house tours, and project photos, I got fairly familiar with the layout. The only part that I still wasn't 100% clear about was the location of the office/guest bath on the second floor. I should make myself a proper floor plan, but for now I'm content with my cheaply thrown-together floor plan (which I posted in one of my first ever blog posts). It makes a lot of sense once it's laid out like this, but I can see how it's a little odd from the photos we've posted. I've wanted to do real architectural drawings for a long time now. Need to dust off those skills I once had but seem to have misplaced after college. Alex, am I ask what online thing you used for the floor plan? Besides the color floor bit, it seems solid enough for what I need. Sure thing. I used www.floorplanner.com. I tried out several other options but this seemed to be the easiest to quickly do a decent quality mockup. I had puzzled out the main floor, but had the second floor all confused, especially the guest bath/office space. And I know ALL about the unfinished basement/laundry room of horror. Do you guys ever see having kids? We raised one in a two bedroom house, but it was TIGHT when he was a teenager. 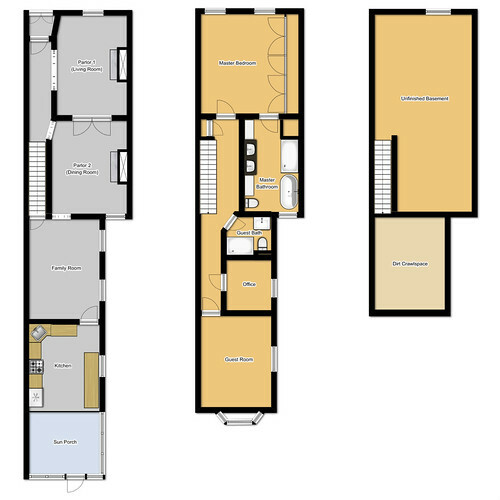 I am always interested in seeing layouts of other long skinny/row house type floor plans. You have a really nice big main floor! Our second floor is similar, although we only have one full bath, and the space that your office & guest bath take up is our third bedroom. I really need to draft up floor plans, but have been avoiding it like the plague! I've been meaning to draft up some decent plans of our house, but have not had the time. In the meantime, I've been using sketches I made on green engineering grid paper. It gets the job done, but is not the neatest thing around. For some reason I thought your row was wider than 15 ft. The floor plans are fun to see!